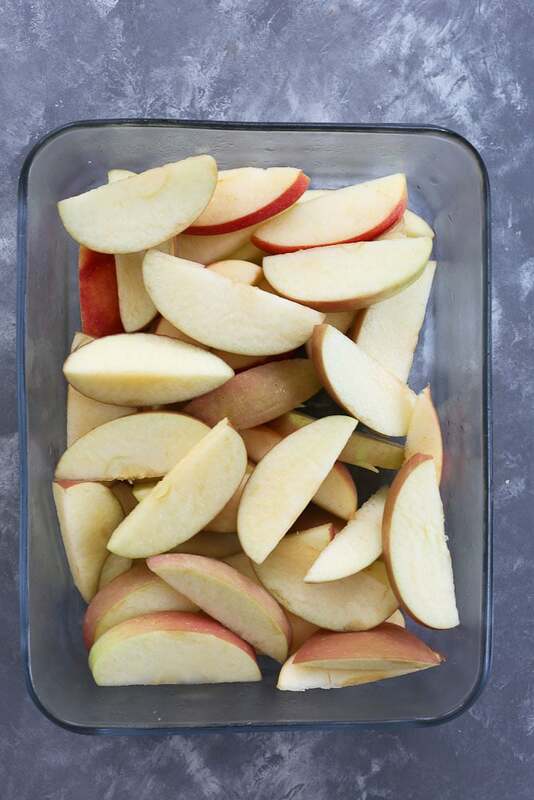 If you want to send apple slices in your kids’ lunches or keep them overnight, you need to know how to keep apples from turning brown! Let me show you the best way! How to keep apples from turning brown?! After replying to the message countless times, I realized a lot of people would benefit from a blog post on this topic. It’s so simple, yet such a game changer when you figure out how to keep apples from turning brown! I know I wouldn’t eat brown apple slices if that’s what I saw when I opened my lunch box. Would you? I learned the method from a friend about a year ago. Before that, I used lemon juice, but this method is even better! Instead of lemon juice, I now use salt. The apples stay a good color longer and there’s absolutely no taste! Sometimes I would use too much lemon juice and my kids would complain they could taste it. Problem solved! First, slice as many apples as you want. Then fill a big enough bowl that will fit all of your slices with water. 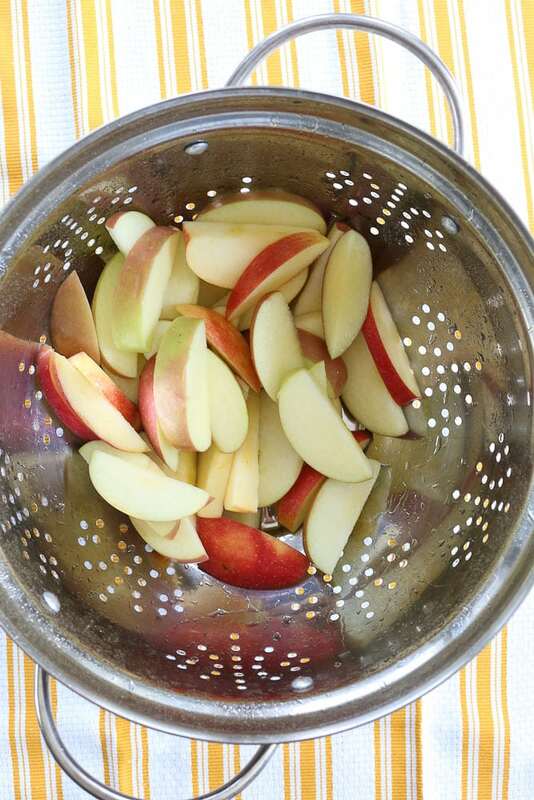 Stir in 1 teaspoon of salt per apple that you sliced. Stir until the salt dissolves. 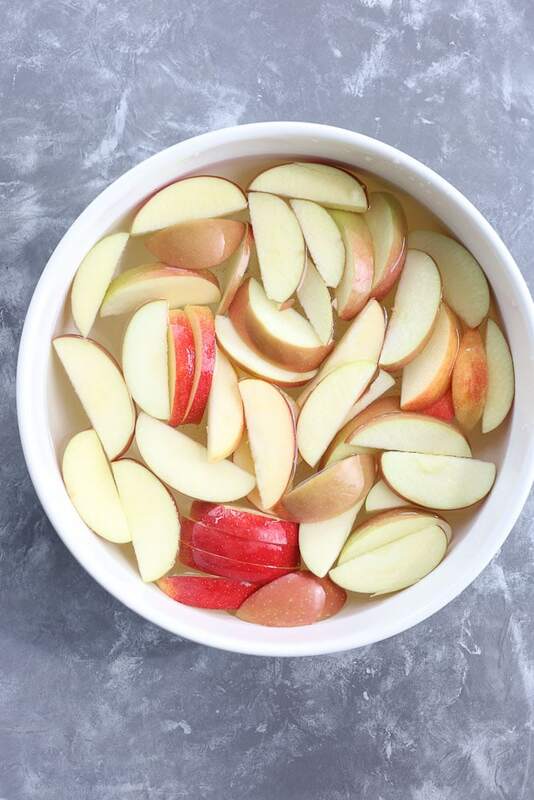 Put the apple slices in the bowl and let the apples soak in the salt water for 5-10 minutes. Drain the apple slices and rinse them well. Allow them to dry and then you are ready to store them or send them in the lunch box! The apples in this picture have been sliced for over 24 hours. 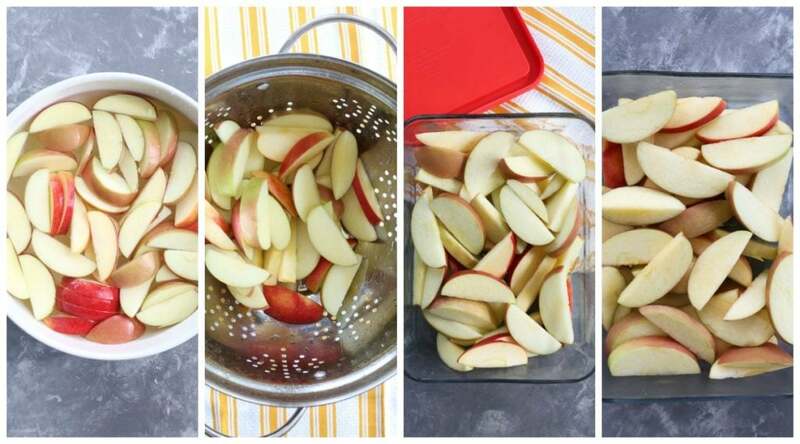 YES, you can keep apples from turning brown overnight! These apples had some very slight browning after this amount of time, but nothing that would stop my kids from eating them. They are even more white when you eat them within 12 hours. I hope this post helps you! If there’s someone you know who would like to know how to keep apples from turning brown, will you share it? I appreciate you! 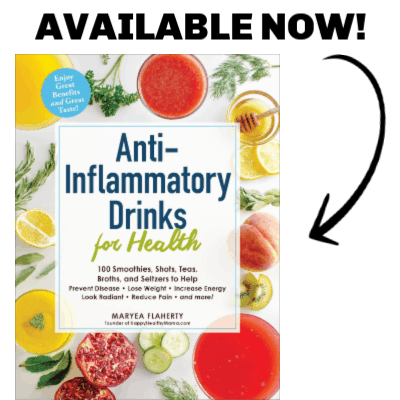 Looking for healthy apple recipes? Check out this collection of 20 Apple Recipes that my family loves! Adding non essential salt to a child’s diet in service of preventing a browned apple slice – do not see how this is a healthy or a good idea. I’m sure very little salt is added to their diet after rinsing the apples. In addition, my children eat very little processed foods and I’m not particularly worried about their salt intake. I really need this. Thanks for sharing your idea. It really worked well. Would this also work for apples that you’re preparing for baking such as apple pie? I find that once I’ve got all the apples peeled and sliced they are turning brown. Great idea, I’m going to try this!